Digitalization is driving the education sector on to a profound transformation. The report “The Road to Digital Learning” by Fujitsu showed that many schools, colleges, and universities have high aspirations for digital learning, in which academic establishments acknowledge the role of technology in improving the education milieu and creating equal opportunities. In the Philippines, Xavier University - Ateneo de Cagayan believes that addressing the demands of digital learning is vital to enable advanced waves of educational approaches for her academic community. Guided by its vision of becoming “A leading ASEAN University forming leaders of character by 2033,” Xavier Ateneo leverages on the benefits of information communications technology (ICT) to extend the best environment for its students. 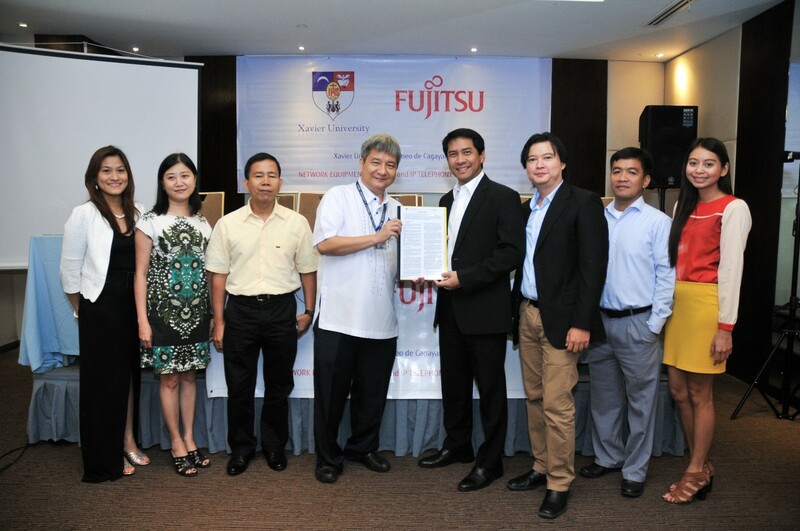 XU has recently joined forces with Fujitsu Philippines, a global leader in providing ICT solutions, to boost the connectivity in all its five campuses across Cagayan de Oro City. “Digitalization and connectivity have emerged as a necessity for educational institutions. It allows us to make our students globally competitive. To achieve it, we have invested a lot in building and improving our IT infrastructure across all campuses,” said Edison B. Sasoy, Xavier Ateneo Vice President for Administration. “All our current and future ICT initiatives are centered on the university’s core processes that include teaching and learning system, research, and social development,” he added. In 2009, the university has first laid the backbone of its network infrastructure. Over the years, it has been upgraded to host more information and enterprise systems to allow for a more conducive and digitally-inclined learning environment. Two of these systems are the Student Lifecycle Management and Information System (SLMIS) and eLearn, which manage all student-related services and business operations. These are web-based systems that manage student records, both academic and financial, in a secure, stable environment. Students in various levels — technical-vocational (Center for Integrated Technologies), college (undergraduate and graduate studies), professional (law and medicine), and continuing professional education levels are able to access their information anytime, anywhere. The university’s Computing and Information Services Office (CISO) saw the need of further advancing the university’s IT infrastructure in terms of (1) connectivity, (2) security, and (3) high availability. Harriet B. Fernandez, CISO Director, said that without a stable network infrastructure, all the information systems that they currently have and those that they plan to integrate will not be able to operate efficiently. On top of that, XU also wants to blanket the whole campus with WiFi connection and bolster its IP-based telephone system. The three components of the network system upgrade are set to significantly enhance the productivity of its faculty, staff, and students through the use of a fast and reliable network. In 2011, it has started the integration of solutions centered on Cisco and Ruckus products. Cisco’s Catalyst 4500-X is the core that provides 10G connections across XU’s buildings and campuses. Cisco Nexus 9300, on the other hand, provides the data center infrastructure that connects its existing Unified Computing System (UCS) Server and NetApp Storage. To ensure network security, Fujitsu translated XU’s security requirements by incorporating the Cisco ASA 5585 firewall with Intrusion Prevention System (IPS) and Advanced Malware Protection, and Cisco Identity Services Engine (ISE). For added defense, Cisco IronPort Web Security Appliance was placed to protect the university from phishing sites and other online threats. This appliance also allows XU to implement policy-based web filters that enable easy implementation of the existing Information and Communications Technology (ICT) policies. Ruckus Wireless System was also included to provide WiFi connection throughout the main campus and the annexes. According to Fren Marlon B. Peralta, CISO - Computing and Network Services Unit Head, the upgrade has aided their team in boosting the capabilities of their network in which they are looking at an eight to 15-year lifecycle. “Our next steps are now focused on the optimization of the converged campus network infrastructure, especially now that we are moving towards an online campus setup. All of the student services like admissions and enrollment, as well as student evaluation and assessment are now accessible online,” Peralta shared. “Maybe, in the coming years, the university may also venture to offer online courses,” he added. Xavier Ateneo is a private Jesuit-run university situated at the heart of Cagayan de Oro City, Philippines. At present, it caters to more than 14,000 students from basic education to secondary, tertiary, graduate, and professional studies. XU operates on five campuses: Agriculture extension called Manresa; Center for Integrated Technologies on Masterson Avenue; XU Grade School campus in Macasandig; XU High School and Grade School Annex in Pueblo de Oro; and main senior high and tertiary campus along Corrales Avenue. “We see the value of digitalization for advancing the capabilities of educational institutions in enabling for a better learning experience for their students. It is one of our thrusts to support these visions of providing a tool that would make learning fun, convenient, and available,” said Cricket Santiago, Fujitsu Philippines Chief Executive Officer.